NOSE: Fruit, spice and everything nice. Oranges and apricots, coriander and clove, and a healthy dose of funky Brettanomyces yeast aroma. TASTE: Slightly sour citrus fruits up front with a heady mix of sweet, pale malt and big, peppery spices in the middle. The finish is drying, slightly bitter, and mouth-puckering. The funk from the Brett is subtle, but present throughout the sip. DRINKABILITY: Highly drinkable and refreshing. Not overwhelming at all, but plenty of complexity and character to make it worth revisiting. 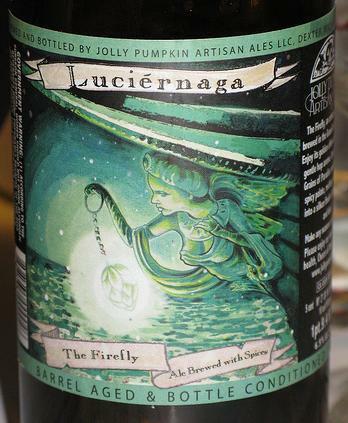 Another solid effort from Jolly Pumpkin. Posted in Tasting Notes.Tagged Belgian Pale Ale, Jolly Pumpkin, Luciernaga.